When Roopa Farooki’s first novel was listed for the Orange Prize for New Writers, I waited and waited for you to get a copy of her book. And then I gave up. I know, I know: you’ve got it now. 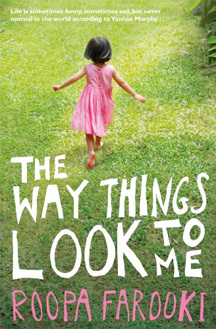 And you’re “onto her”, at last; you had copies of The Way Things Look to Me on order even when this year’s Orange Prize longlist was announced. That’s how long I’ve been on the hold list for The Way Things Look to Me, since the beginning of March. I didn’t mind waiting for you to receive and process the novel; I know Canada Post takes f-o-r-e-v-e-r to ship books (which I’m sure has nothing to do with my wanting them to arrive faster than anything else) and you’re very busy. And I know lots of other people want to read Roopa Farooki‘s novel too, so I don’t mind waiting for them to take their turn. But I’ve been at the top of the list for more than a couple of weeks now, in first place. My copy of this novel (yes, I’ve been thinking of it in these intimate terms — mine — since I reached the top of the hold list), would be my last official Orange Prize read for this year’s longlist. I know this doesn’t mean anything to you, but I’m nearly Orange-d out. This would be the 16th book I’ve read for this project throughout April and May, assuming that I manage to finish reading Hilary Mantel’s gargantuan masterpiece, Wolf Hall, before the prize is announced on June 9th. I was nearly desperate to pick-up Roopa Farooki’s novel and read it so that I could tick the final box on my spreadsheet for this reading project. But my copy (yes, mine) of The Way Things Look to Me has been in transit for 11 days. I asked one of Your People about this yesterday. I was concerned because it’s happened to me once before, a new book travelling in my direction for an untoward length of time, and in that instance it was finally determined that it had never really left its original location and it took two months for me to get my longed-for copy (yes, it was Mine too). But Your Representative was vehement about the fact that it could take up to 7 days for a book to travel between branches. Yes, up to a week. I nodded. (I know the policy. Of course I know the policy.) I explained that I thought there was a problem because I’ve picked up several other holds over the past week, from various branches, but there was still no sign of Roopa Farooki’s book. I mentioned that I asked for another book on Monday and had picked it up on Tuesday. Yes, she said, but it can take up to a week. Yes, I agreed. Up to seven days. But it has been eleven days. And I realize even while I am saying this that I must sound absolutely insane. As if it could really matter so much. And I also realize that it would sound more impressive if it had been fourteen days, twice as many days as it should have taken, and I nearly wish that were the case. But it has only been eleven days. Which, however, is still four more than it apparently takes. Well, she said, an audible shrug in her tone: it’s not here. I should add that I was relatively hopeful when I approached the counter because this was not one of the people You have working for you who clearly excel at behind-the-scenes work. (That’s accentuating the positive, by the way.) I’ve spoken to this one of Your People before, and she seems a reasonable sort: so I decided to try another tack. I got an email this morning, I said, which stated there was a book here for me to pick up but that, for technical reasons, the automated message was unable to display its title. Is it possible, I asked, that this is related to my Roopa Farooki problem? Because I’ve got this hold here to pick up, I said. And I showed her my copy of Virginia Woolf’s Nose. (In hindsight, I’m not sure that borrowing a book with that title endeared me to her.) But I already received an email about this one later on Tuesday, so I don’t think today’s email was about it. That other book is not here for you to pick up, she repeats. The System says that there is only one book for you. She points to Virginia Woolf’s Nose. That book. That other email was probably for that, too, and it was probably a mistake. Well, I couldn’t think of anything else to say. And I knew she wouldn’t care that this would have been my 16th and final Orange Prize read for this season. That I would have chosen something else Orange-y for this Thursday, my last Orange Thursday, if I hadn’t been so sure that Roopa Farooki’s novel would arrive in time. So I just thanked her (because I am Canadian and have received years of training that urge me to be polite even when my inner Orange-ness is raging) and went home, all Roopa-Farooki-less. And I brought home Virginia Woolf’s Nose. Which I had been quite excited about reading but which now paled in comparison simply by virtue of its not being The Way Things Look to Me. So this morning I get another email — the third such email, apparently — asking me to come and pick up my copy of Virgina Woolf’s Nose. And I really just don’t get it. How can a mistake like this one — a woman having three noses for heaven’s sake — be admitted? But my errant copy of Roopa Farooki’s novel is presumed to be on course, just needing its legislated seven days to travel to me? Dear Public Library: maybe something’s wrong with The Way Things Look to Me? Raidergirl – I hardly notice the splashing sounds from beneath. Kat – I know, I know: it’s *got* to be somewhere. LOL! I hope you get your copy soon. I’ve had some pretty traumatic experiences with library staff through the years too. I know there are many, many, many dedicated people working in libraries around the world – I’ve met some of them online – so why I only ever seem to meet the uncertain/unenthusiastic/grizzly ones? I remember requesting a series of children’s books from the main libary when I was about nine years old, one by one, going back to my branch each week to collect the next one. About mid-way through I went in to collect my book only to discover that they had accidentally sent the final volume in the series instead of the one I had asked for. I politely pointed this out to the assistant behind the desk. She looked at it, bored and uninterested, and then thrust it back at me. ‘Won’t this one do?’ she said, ‘They’re all the same.’ All the SAME I wanted to cry, all the SAME! Don’t you know they’re not all the same? And that if I read this one before the others it will spoil the ending, and ruin the whole series! But I didn’t say that. I quietly took my book and went home, and hid it until I could take it back the next week. Very, very funny! And how true of library personnel. Where DO they get their training? The book has to be somewhere. How frustrating! wow, you are much more polite and understanding sounding than I would be. The sarcasm would be dripping in puddles under my computer. Good luck with Them at the library.